Poker Interest By State - Which USA States Love Poker More? It's been called America's card game. Celebrities love it and so do an estimated 60 million Americans – whether at the card table or from the comfort of their own computers. Poker has sparked love affairs, inspired movies, and won over people everywhere who love excitement, savor a challenge, and enjoy the art of bluffing. We wanted to gauge just how intriguing poker is to people across the country and around the world. Who displays the most interest in poker? Which cities have the most poker-love? And Which countries are showing growing interest in the game? Read on to get the real deal on poker's popularity. One sure way to discover where people's interests lie? See what they search for online. 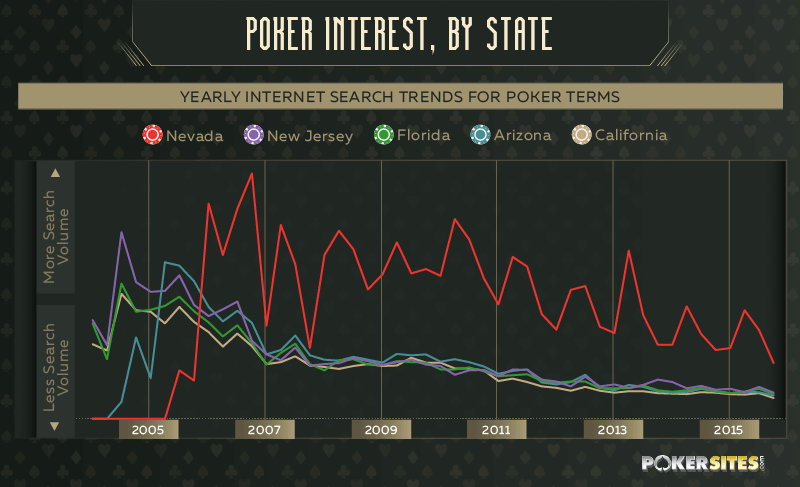 We mapped the search prevalence of poker terms over the past 12 years. No surprise here: Whether visitors or residents, people in Nevada – home to gambling capital Las Vegas – have always had a penchant for poker. In fact, people in most parts of the country appear to maintain an interest in poker save for one area: the Mountain West region, including (with some variations) Idaho, Utah, Montana, Wyoming, and North and South Dakota. Why? Simply put, these states don't tend to be gambling meccas; for instance, Idaho state law prohibits Texas Hold'em, and Wyoming is home to only two poker rooms (four tables total). 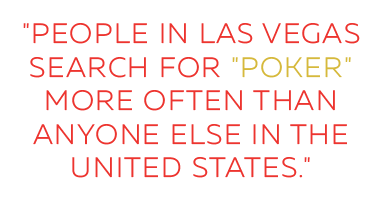 Of every state, Nevada is far and away home to the most frequent searches for poker-related terms. Why? Vegas, baby. Spikes occur each summer, probably due to various reasons: for one, the annual World Series of Poker (an event in its 46th year); for another, the kickoff of summer vacation, when visitors can hit the casinos and take advantage of lower hotel rates. Second-place New Jersey is home to casino hub Atlantic City. One popular search? The Borgata: a large casino that also offers online poker. Real-money online poker is actually illegal in all but three states: Nevada, New Jersey, and Delaware. 2006 marked a turning point for poker: Congress passed the Unlawful Internet Gambling Enforcement Act, which effectively shut down many online poker sites. Five years later, in 2011, the U.S. government shut down online poker and arrested owners of some of the largest sites. The same year, live poker streaming site Twitch launched – and its popularity is soaring, as millions of users flock to the site to watch poker stars compete, get tips and tricks, and meet fellow fans. And 2013 saw a major milestone: the first legal online poker game for real money. Examining search prevalence by city reveals some interesting results. Las Vegas, of course, comes out on top. Cities in California claim two of the top 10 spots: Milpitas, home to a now-defunct poker store and Irvine, located near popular casinos featuring poker tables. Florida makes the list three times: Tampa, Miami, and Orlando. Tampa and Miami both offer plenty of opportunities for poker playing at casinos, while Orlando boasts a thriving Texas Hold'em organization. 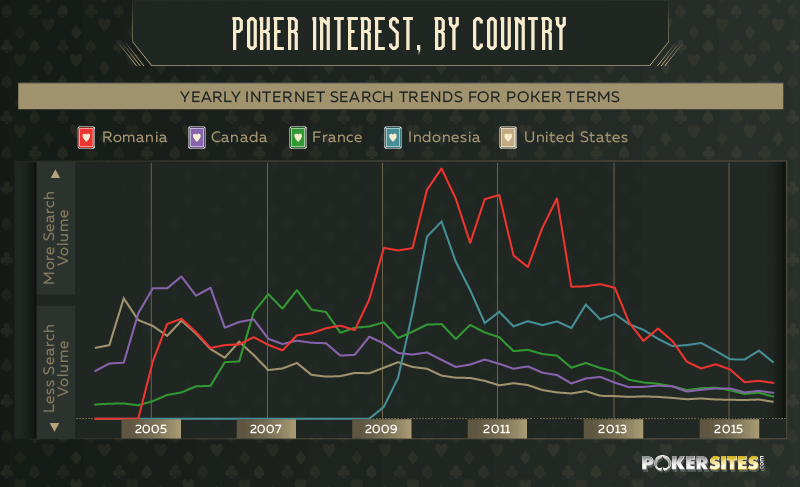 Examining poker interest by country paints an interesting picture. Home to multiple casinos, top spot Romania is establishing itself as a hub for gambling thanks to a law that, among other things, lowers gambling taxes and allows foreign operators. This should increase the presence of both online poker and live poker games. Why the increase in interest in 2009? PokerStars Romanian Open – the biggest poker tournament to date in the country. Second-place Canada is a poker hotspot, featuring plenty of casinos and tournaments. Online poker laws are lax. In fact, the country established itself as a haven for U.S. online poker players after the U.S. made it illegal in 2011 – and many U.S. pros have even moved north. What's the most frequently searched poker variant? The chart above reveals that Texas Hold'em is the fan favorite by a landslide – at least when it comes to search trends. Beloved by both casual players and pros, Texas Hold'em exploded in popularity in 2004 – after amateur Chris Moneymaker inspired thousands of budding players by winning $2.5 million in the 2003 World Series of Poker. During the game, players make their best five-card hands by drawing from seven cards (five community cards and two from the dealer), and then multiple rounds of betting ensue. No poker variant comes close to Texas Hold'em in search trends, but the next-most searched is a derivative of it: Omaha Hold'em (or Omaha poker). The game is similar to Texas Hold'em, but players receive four personal cards rather than two. Next comes Five-Card Stud – the oldest variant of poker that people still play today. Players are dealt only five cards at a time, so many hands are won with pairs or less. The least searched variant, Razz is a popular version of Seven-Card Stud in which players use five of their seven cards to make the lowest possible hand (Aces are low). Next, we zoomed in on search trends for these less popular poker variants. 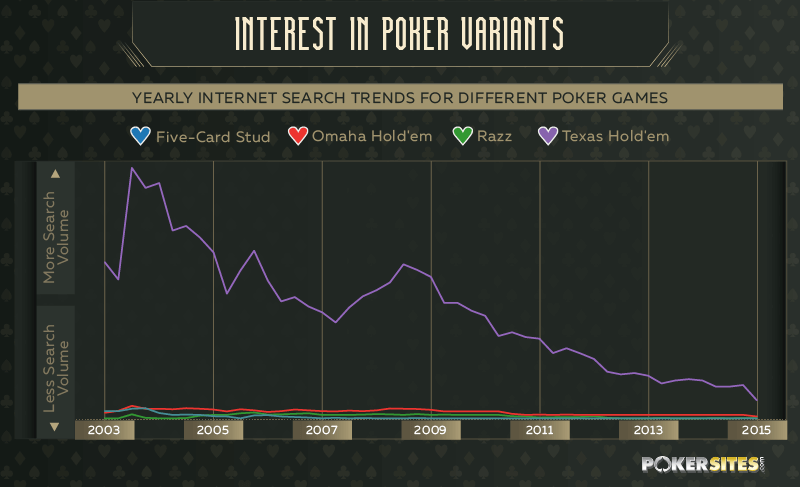 Removing search powerhouse Texas Hold'em from the graph allows us to zoom in on the search trends for the less popular poker variants. 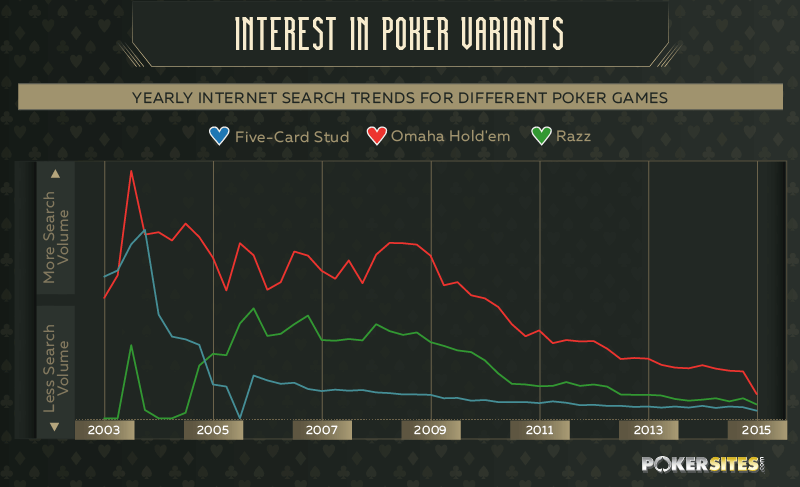 All three variants (Five-Card Stud, Omaha Hold'em, and Razz) saw peaks in 2004. Why? It was a big year for poker. Annie Duke became the first woman to win a multi-million dollar prize in the WSOP Tournament of Champions. Additionally, a televised pro poker league launched. Though it only lasted a year, the Professional Poker Tour featured appearances of some of poker's greats. As for Razz, in 2004, the game gained popularity when poker star T.J. Cloutier won the WSOP Razz table. After 2004, Omaha Hold'em then saw numerous ups and downs before entering a steady decline in 2009. Razz and Five-Card Stud both saw another peak in 2006 – perhaps in part due to the 2006 Unlawful Gambling Enforcement Act, which banned online gambling, including online poker – before their decline in search frequency. Does the decline mean anything? It may not. A 2014 study revealed that poker is the third-most popular game among casino visitors (behind slots and blackjack). And for young gamblers at least, poker is actually a huge draw in casinos. Las Vegas still reigns as the top poker spot in the U.S. It's clear that the landscape of poker in the U.S. is evolving, predominantly due to technology. But across the country and around the globe, poker is fun for fans and players in many venues – around the kitchen table, at the local casino, and even in front of the computer. While interest levels may fluctuate, one thing is clear: America's game is here to stay. We measured interest using search volume data from Google Trends for various search terms and topics. Google Trends data was exported December 2015 through February 2016 and measured quarterly. Feel free to share the images found on this page freely. When doing so, please attribute the authors by providing a link back to this page, so your readers can learn more about this project and the related research.